Following the Indy 500, Scot Dario Franchitti is walking on cloud 9 capturing his second Borg-Warner Trophy impression in dominant fashion. On the other side of the fence, the favoured three-car team of Penske Racing faced a surprising meltdown. Suffering a pit road mistakes and a crash to Ryan Briscoe, it was the worst overall Penske performance since the 1995 race where Penske's two-car team of Emerson Fittipaldi and defending race winner Al Unser Jr failed to qualify. With the next 500 mile race at the Indianapolis Motor Speedway a year less a week away, Penske Racing will use the IZOD IndyCar Series schedule as a measure to reassert their dominance. The early laps of the Firestone 550k at Texas Motor Speedway was the latest edition in the Penske Racing vs. Target Chip Ganassi Racing bout. With Ryan Briscoe leading the first 7 laps from pole, 2010 Indy 500 winner Dario Franchitti took the lead wanting an encore performance of last Sunday. 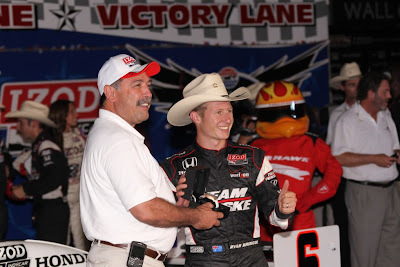 Leading 86 laps total through the night, Franchitti would have a strong follow-up to this Indy win at Texas. The first caution came out on lap 57 for KV Racing Technology's #5 of Takuma Sato who collided with the wall within turn 2. Just 6 days later the Indy 500 wreck which featured Mike Conway suffering a nasty impact with the Indianapolis Motor Speedway catch fence, another frightening impact occurred when 2010 Indy 500 Rookie of Year Simona de Silvestro slid into the wall on the backstretch on lap 98. While the impact was not severe, her #78 HVM Racing/Team Stargate Worlds car erupted into flames. With fire rapidly rushing to the cockpit, de Silvestro was in a rush to get out of her car. With the aid of some safety crew workers, Simona de Silvestro was hurriedly extracted from her vehicle. Sustaining a burn to her right hand, de Silvestro was expressing more disappointment in the fact she was unable to fight her loose race car through the laps leading to her crash. The most significant crash in the Firestone 550k occurred on lap 129. Coming out of turn 4, Helio Castroneves had been setting up the KV Racing Technology #32 car of Mario Moraes to pass on the outside. As the #3 Verizon car began to blaze past Moraes on the outside, the #32 edged up and tangled with the Castroneves. As the two race cars of Castroneves and Moraes would slid down the front tri-oval stretch, the Conquest Racing #36 of Bertrand Baguette would become a casualty to the incident as he attempted to duck between the wrecked cars. As the vehicles of Castroneves and Moraes were still in motion, Baguette clipped both cars suffering race-ending suspension damage. Immediately after getting out of his #3 Penske Racing machine, Helio Castroneves quickly approached Moraes expressing some passionate words of displeasure. After the accident, it was reported that the #32 car did not receive radio communication of Castroneves passing him. In the final results for the Firestone 550k, Helio Castroneves would place 20th for what might amount as a costly night for the overall IZOD IndyCar Series points. 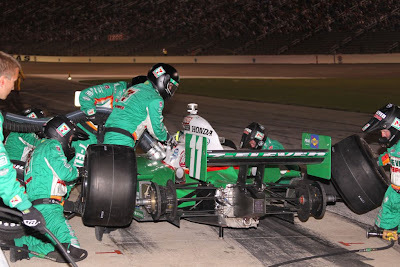 Through a final round of pit stops proceeding under green, pressure was placed on the crew members and drivers in the late stages of the Firestone 550k at Texas Motor Speedway. Appearing as if they could expect another respectable oval finish in 2010 leading a midway portion of the event, the FAZZT Race Team #77 car driven by Alex Tagliani would see their day go sour on pit road. Through the completion of their pit stop, the #77 car left before the refueling hose was disconnected. FAZZT Race Team fueler Phil McRoberts was struck by the fuel hose but was fortunately unhurt thanks to wearing his helmet (a requirement of all over-the-wall crew member in IRL sanctioned events). However, the FAZZT Race Team would be required to bring Tagliani back into pit lane for a drive-through penalty on the miscue. As the field cycles through under pit stops, Ryan Briscoe relinquished his lead position for fuel and tires coming down to his Penske Racing pit crew. However, as Briscoe is released back into competition around the 1.5 mile oval, the #7 Andretti Autosport team preformed a stunning pit work for their driver Danica Patrick which allowed her to come out of pit road ahead of Briscoe. As Dan Wheldon and Hideki Mutoh had pit stops upcoming, this fight for third would end up becoming the battle for the race lead and victory. With Patrick briefly able to use her crew's gain on pit road to keep the #7 car ahead of the Penske Racing machine of Briscoe, the #6 car would be relentless charging back on Danica Patrick's car. After several laps of dicing, Ryan Briscoe was able to emerge with the upper hand. Holding the lead through the final 35 laps, Ryan Briscoe captured a much-needed first win for 2010 after experience a difficult year so far in the IZOD IndyCar Series. The fourth win for Penske Racing on the 2010 tour, all three team drivers have collected at least one victory for the Verizon-sponsored team. While Team Penske recovered nicely at Texas, the efforts of Andretti Autosport is worth special consideration. Perhaps running her best race since her 2008 win at the Twin-Ring Motegi race in Japan, Danica Patrick gave a consistently strong run for the Godaddy.com #7 car finishing a little more than 1.4 seconds behind Briscoe. Following up his podium run finish at Indy, Marco Andretti secured another 3rd place finish at Texas. the final two Andretti Autosport drivers also made massive gains from their starting spots with Tony Kanaan going from 13th to 6th and Ryan Hunter-Reay improving 17 positions to finish 7th. Thanks to three races of oval success, Dario Franchitti has overcome the early season lead that Penske Racing's Will Power gained through the road courses. Standing a slight 3 points ahead of Power, 1st through 6th in the 2010 IZOD IndyCar Series overall championship is separated by only 45 points. The next race is in two weeks at Iowa Speedway on June 20th.